Holme Tunnel has been a problem tunnel for many years, and now Network Rail have had to return to do battle with the poor strata that the tunnel passes through. The Network Rail measurement train successfully passed through the tunnel on Sunday 23 March 2014 at about 11 a.m., making its way down to Hebden Bridge, where it reversed and passed back through the tunnel in the opposite direction. This must have been judged a success as the tunnel reopened to traffic on Monday 24 March 2014. The following photographs are provided courtesy of Network Rail and show something of the nature of the works, and the final shotcreted finish. Network Rail's official press release is at the bottom of the page. 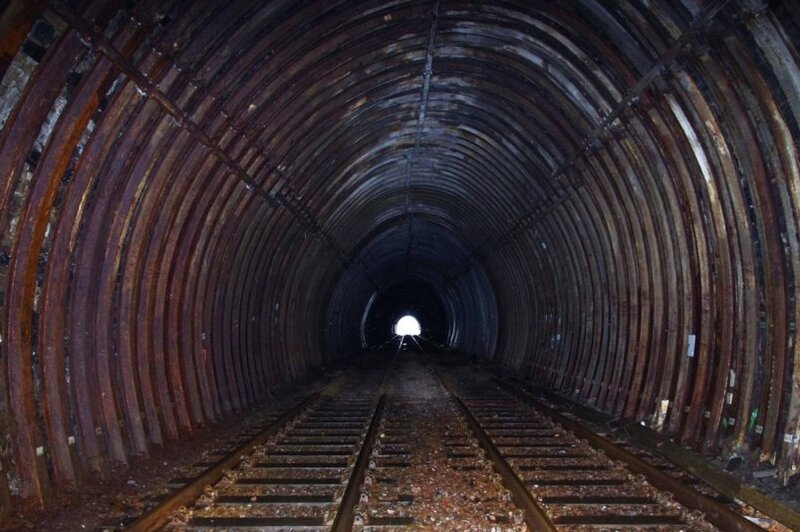 One of the very first railway tunnels to be shotcreted in the UK was Moelwyn Tunnel on the Ffestiniog Railway in 1976. Holme Tunnel southern portal prior to work starting with 20 mph speed restriction sign still in place. The interior of Holme Tunnel prior to work starting showing the original strengthening added in 1986 by British Rail. Shotcreteing in process: the first time this technique was used in a UK railway tunnel was on the Ffestiniog Railway's new Moelwyn Tunnel constructed in 1976. Holme Tunnel southern portal with work underway. Holme Tunnel southern portal as rebuilt. It is worth recalling that one of the pioneering uses of this technique for a railway application was by the Ffestiniog Railway in North Wales. The Ffestiniog has been an innovator throughout its long history, and true to character in the 1970s built a whole new section of railway between Ddaullt and Tan y Grisiau involving a number of structures, including a 248 metre long tunnel through solid rock. Brian Hollingsworth provides a very detailed account of the Ffestiniog Deviation story in his book 'Ffestiniog Adventure', including much detail on the shot-creting process. Brian records that the system chosen by the Ffestioniog was the Norweigian SEM Wet Shotcreting Process, then new to the UK but offered by Sykes Construction Services of Warrington. In this process the spray gun atomises the concrete liquid by means of a jet of compressed air. Various 'agents' can be added at the nozzle, one of which causes the mix to set instantly on contact with the rock. The Ffestiniog decided on a 'do-it-yourself' approach and found itself on a long and tortuous learning curve. However, Brian writes: "...the job of lining the tunnel took six months from January to June 1978. It was a long and unpleasant task, made worse by endless frustrations and delays whilst experience was gained, plus far more than a fair share of bad mechanical luck with the conventional items of equipment...Dave Payne, in fact, put his experience to good use afterwards in taking a post as a shotcreting expert with Sykes Construction Services. It is a measure of the level which the team's expertise finally reached that a Shotcreting Open Day was held on 27 March; interested civil engineering people came from far afield and it was a very instructive and well organised occasion." 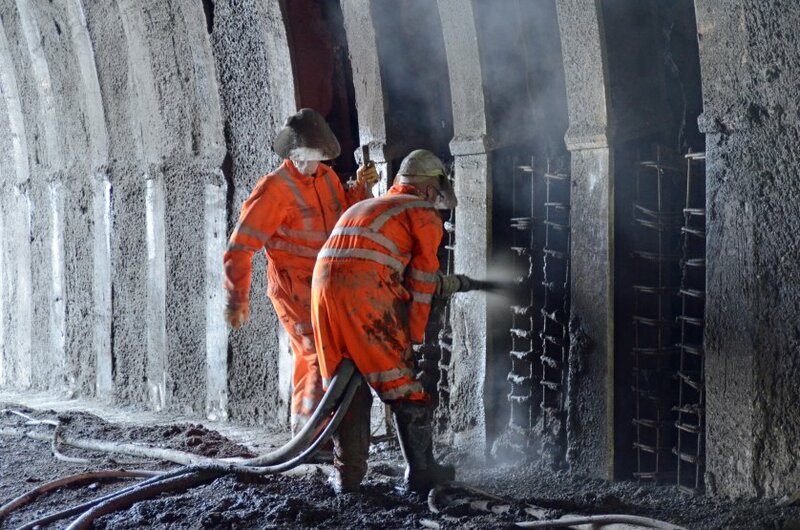 "Repairs which saw more than 3,000 tonnes of concrete used to strengthen a vital rail tunnel in the north west of England have been completed. 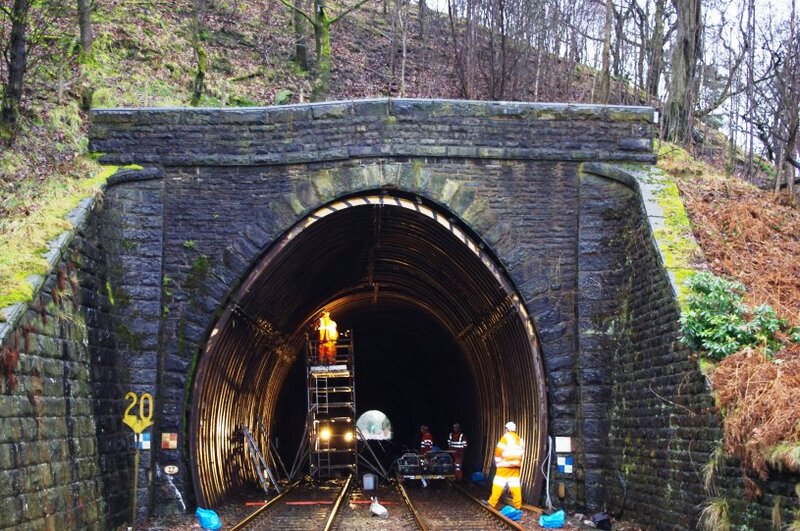 Holme Tunnel, on the line between Burnley and Hebden Bridge, reopened to passenger services this morning (24 March) after a 20 week closure to carry out essential improvement work. The 250m tunnel had become increasingly misaligned over time because of local ground movement which had distorted the tunnel walls. Network Rail realigned and strengthened large sections of the tunnel’s walls and re-laid more than two kilometres of track within and on the approach to the tunnel. 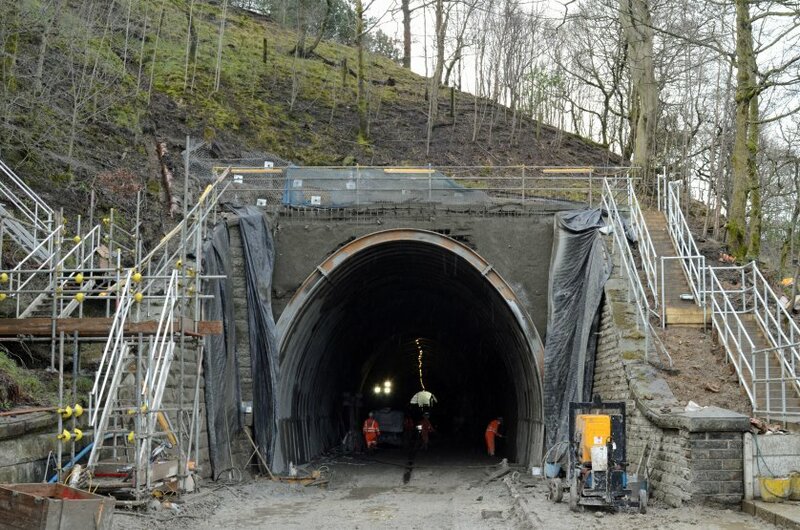 Ian Joslin, area director for Network Rail, said: “It was a significant engineering challenge to repair and strengthen Holme Tunnel, which although safe for trains to use before the closure, had been significantly damaged over the years because of ground movement. “On average more than 40 tonnes of new materials were used for every metre of reconstruction within the tunnel, a measure of the scale of the challenge and work undertaken.